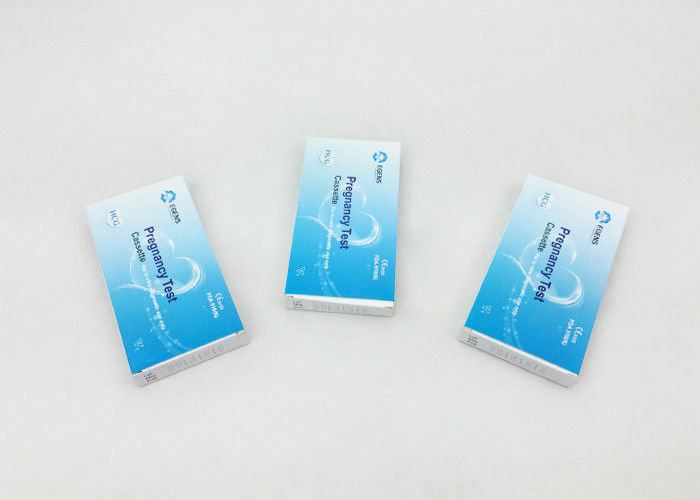 hCG One Step Pregnancy Test Cassette (Urine/Serum) is a rapid chromatographic immunoassay for the qualitative detection of human chorionic gonadotropin (hCG) in urine or serum to aid in the early detectionofpregnancy. Human chorionic gonadotropin (hCG) is a glycoprotein hormone produced by the developing placenta shortly after fertilization. 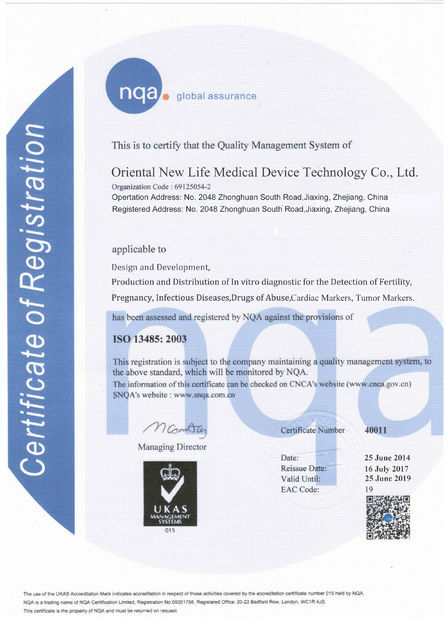 In normal pregnancy, hCG can be detected in both urine and serum or plasma as early as 7 to 10 days after conception. hCG levels continue to rise very rapidly, frequently exceeding 100mIU/ml by the first missed menstrual period, and peaking in the 100,000-200,000mIU/ml range about 10-12 weeks into pregnancy. The appearance of hCG in both the urine and serum or plasma soon after conception, and its subsequent rapid rise in concentration during early gestational growth, make it an excellent marker for the early detection of pregnancy. The hCG Pregnancy Rapid Test Cassette is a rapid test that qualitatively detects the presence of hCG in urine or serum or plasma specimen at the sensitivity of 25mIU/ml. The test utilizes a combination of monoclonal and polyclonal antibodies to selectively detect elevated levels of hCG in urine or serum or plasma. At the level of claimed sensitivity, the hCG Pregnancy Rapid Test Cassette shows no cross-reactivity interference from the structurally related glycoprotein hormones hFSH, hLH and hTSH at high physiological levels. 1. Bring the pouch to room temperature (15-30℃) before opening it. Remove the cassette from the sealed pouch and use it within one hour. 2. Place the cassette on a clean and level surface. Hold the dropper vertically and transfer 3 full drops of urine or serum or plasma (approximately 120ul) to the specimen well of the cassette, and then start the timer. Avoid trapping air bubbles in the specimen well. See illustration below. 3. Wait for the colored line(s) to appear. Read the result at 3 minutes when testing a urine specimen, or at 5 minutes when testing a serum or plasma specimen. POSITIVE: Two distinct red lines appear. One line should be in the control region(C)andanotherlineshouldbeinthetestregion(T). NEGATIVE: One red line appears in the control region (C). No apparent redorpinklineappearsinthetestregion. INVALID: Control line fails to appear. Insufficient specimen volume or incorrect procedural techniques are the most likely reasons for control line failure. Review the procedure and repeat the test with a new test strip. If the problem persists, discontinue using the test kit immediately and contact your local distributor. As it is with any diagnostic procedure, a confirmed pregnancy diagnosis should only be made by a physician after evaluating all clinical and laboratory findings. If a urine sample is too dilute (ie. 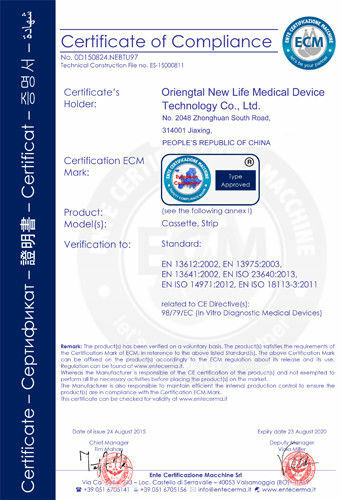 low specific gravity) it may not contain a representative level of hCG. If pregnancy is still suspected, another urine specimen should be collected 48 hours later and tested. Low concentration of hCG in a very early pregnancy can give a negative result. In this case, another specimen should be obtained at least 48 hours later and tested. Elevated levels of hCG can be caused by a few conditions other than pregnancy. Therefore. the Presence of hCG in urine specimen should not be used to diagnose pregnancy unless these conditions have been ruled out. A normal pregnancy can not be distinguished from an ectopic pregnancy based on hCG levels alone Also, spontaneous miscarriage may cause confusion in interpreting test results.